Tidbits about Filet mignon: This most tender, lean, succulent yet elegant meat is from the small end of the tenderloin area of the animal, which is non-weight bearing and not toughened by daily exercise, resulting in extremely tender meat. The name is French for “cute filet” with “filet” meaning thick, boneless slice and mignon meaning “dainty.” ... French: tournedos, filet de bœuf. No matter if I am grilling or sautéing this beautiful cut of beef; I always take it off between 135-140 degrees F. That is a medium-rare temperature but remember it will continue to cook while it is resting. Your family or guests may say, "I like my meat medium" Do NOT over cook this meat. I am not a rare beef eater but this tender meat is so delicate that you don't want to overcook. Season steaks with salt and pepper. Add oil or butter into the pan then add the steaks. Cook each side for 4-5 minutes (for a medium-rare). Remove from the pan and tent with foil. Reduce heat to a medium temperature. Whisk broth, water and Dijon mustard in the pan. Scrape up any brown bits in the pan with a wooden spoon. Add in flour and garlic while continuing to whisk. Add Marsala to the pan and bring to a boil then quickly reduce temperature and let thicken for 1 minute while stirring frequently. 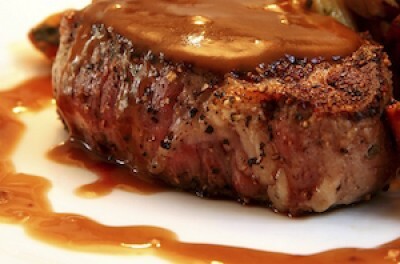 Plate the filet and drizzle Marsala sauce over then enjoy with your favorite sides!